In a competition between two previously unbeaten opponents in the Tri-River Conference, the No. 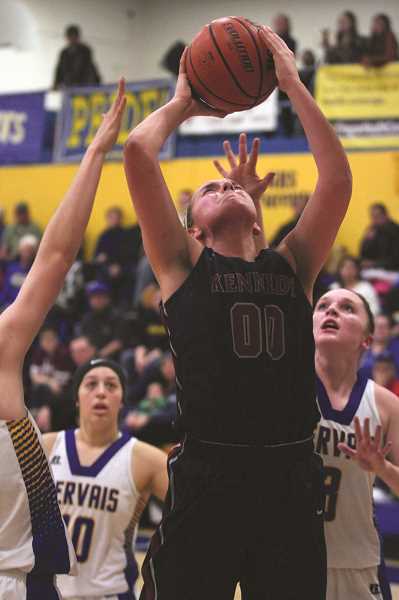 1 Kennedy girls basketball team showed why it remains the team to beat in the 2A Classification, handing the Gervais Cougars a 62-35 loss on Dec. 19. The two teams entered last week's league showdown on the heels of impressive starts to the season. The Trojans (10-0, 4-0 Tri-River), winners of two of the past three 2A state championships had claimed double-digit victories in each of their previous nine games, including a 62-51 road win over perennial 4A playoff contender Valley Catholic on Dec. 14. Meanwhile, the Cougars (5-2, 2-1) had won five straight games by 10 or more points after a season-opening loss at Riverdale. Kennedy was quick to strike the first blow on the evening, pressing throughout the opening quarter and generating turnovers that led to an 11-3 advantage. The Cougars responded with a 5-2 run to cut the lead to just five points, but the Trojans finished the quarter with five straight points to take an 18-8 lead going into the second quarter. Kennedy's lead ballooned to 33-18 at the half due to 17 first-half points from senior forward Kalyssa Kleinschmit. In the third quarter, junior teammate Sophia Carley took over the scoring load, pouring in 12 points to give Kennedy a 48-29 lead heading into the final eight minutes of play. Carley finished with 20 points for the Trojans, while sophomore Araceli Vasquez had 10 points, three assists and three steals for the Cougars. Fellow Gervais sophomore Katie Hansen had four points, four steals, two blocks and six rebounds, while junior teammate Isabel Vasquez pulled down a team-high seven rebounds to go along with four points. 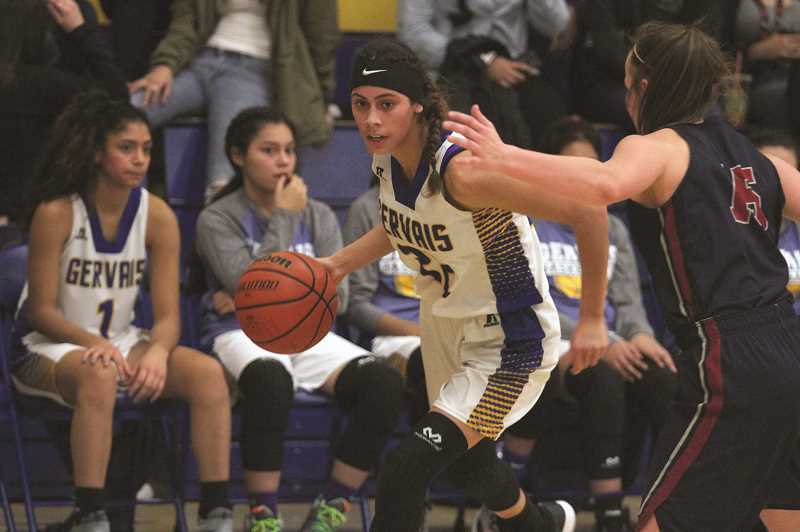 Gervais was scheduled to conclude its week with a trip to Willamina for the Bulldogs' home tournament, while the Trojans were preparing for a game against another top-10 opponent, the No. 5 Oakland Oakers (7-1). Due to an early production deadline, results were not available at press time.